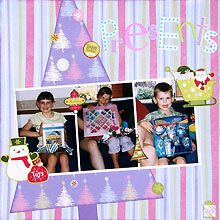 I love Christmas photos and Christmas scrapbooking ideas. In this layout I have used a fun patterned paper to create a Christmas tree background and embellished my page with playful Christmas stickers from American Traditional Designs. This layout was created using Imagination Project Silly Stripes paper, Imagination Project Aluminium Trees paper, dark purple cardstock, white cardstock, purple ink, small purple number stickers, Doodlebug Bright Party Alphabet stickers and American Traditional Santa Sleigh Icons stickers. 1. Use the Imagination Project Silly Stripes paper as your background. Ink the edges with purple ink and set aside to dry. 2. Cut a triangle from Imagination Project Aluminium Trees paper. It should be 12 inches tall and the bottom edge should be approximately 21cm wide. Try to cut it so the trees along the outside edges remain in tact. Ink the edges with purple ink and set aside to dry. 3. Cut a piece of dark purple cardstock measuring approximately 2.5cm by 3.5cm. Ink the edges with purple ink and when dry, attach vertically to the centre of the bottom edge of your triangle to form the trunk of the tree (see picture above). 4. Glue your tree on an angle on the left side of your page, as shown above. Trim away any left hanging over the edges of your page. You may also want to re-ink any edges you trim. 5. Mat three vertical photos with a single piece of white cardstock, as shown above. Glue to your page at an angle towards the bottom and the left edge of your page. 6. Use a selection of your round American Traditional Santa Sleigh Icons stickers as ornaments to decorate your Christmas tree. Use larger stickers like the sleigh and snowman to embellish your photos, as shown above. 7. Use Doodlebug Bright Party Alphabet stickers to create your title in the top right corner of your page. If you select dark coloured letters, you may which to mat them with white cardstock to make them stand out from your background. 8. Finally, place a Christmas gift sticker in the bottom right corner of your page. Place two small number stickers across the middle of the gift sticker to indicate the year the photos were taken.